When it comes to personal oral hygiene, not all men are as attentive to their teeth as women. 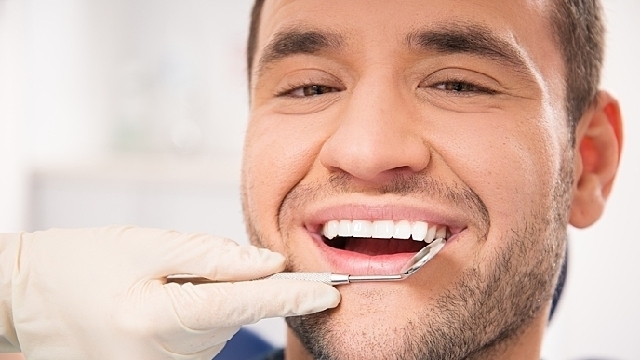 Starting with the checkup, surveys suggests men are more likely to see a dentist only in the event of a problem. So, guys, learn how to step up your oral care routine with the following tips for maintaining a healthy smile and preventing oral health problems before they start. Brushing is just one part of keeping your mouth clean – doing so twice a day, in particular. However, the average man brushes his teeth 1.9 times a day, according to the Academy of General Dentistry (AGD). It’s not enough to brush quickly and be on your way; two minutes of thorough cleaning is your most effective approach. Keep in mind you don’t need to brush hard during this process. Use a soft-bristled brush such as Colgate® Slim Soft™ and brush gently at a 45-degree angle. Some helpful hints: Replace your toothbrush every three to four months, rinse it after each use and store it in an upright position to air dry. Storing it in a container actually allows microorganisms to grow on the brush, explains the American Dental Association (ADA), so it’s best to avoid this method. Playing contact sports can lead to trauma in unexpected places, and this includes broken, chipped or lost teeth. Wear a mouthguard when you’re on the field and a helmet when you’re on your bike. Ultimately, see your dentist as soon as possible after experiencing an incident to quickly assess the damage and determine what can be done to fix it.